The vacation begins tomorrow at 5 am. 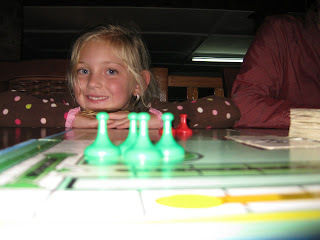 Meredith has prayed diligently for a safe trip to Zanzibar, good time with Nana and Papa, and good swimming. Amelia has made a list of all the fun things she hopes to do like build sand castles, bury papa in the sand, catch a fish, swim before breakfast, try looking at fish in the ocean and collecting sea shells. 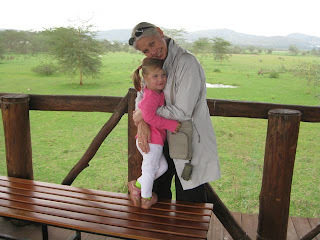 I hope the kids tolerate the flight stopping at Kilimanjaro, Dar salem and then Zanzibar. Malin's already dreaming of sail boarding. But mostly we're eager for a great time with my parents and fun on the beach... thanks Mom and Dad. More blogging in 1 week when sadly the vacation will all be over! 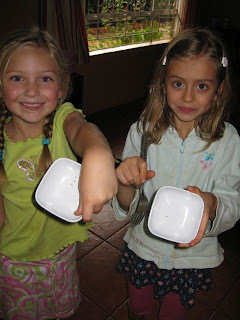 Amelia and Abby brought flying ants home from school (just two) with idea that they could be fried and eaten. 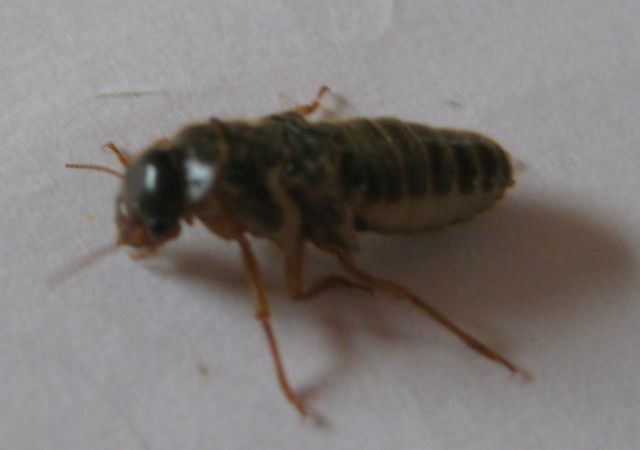 Apparently some tribes in Kenya eat flying ants on a regular basis. First Amelia and Abby removed the wings. Two flying ants being fried with butter. How do you really know when a flying ant is completely fried? Flying ants ready to eat. On the fork and into the mouth! 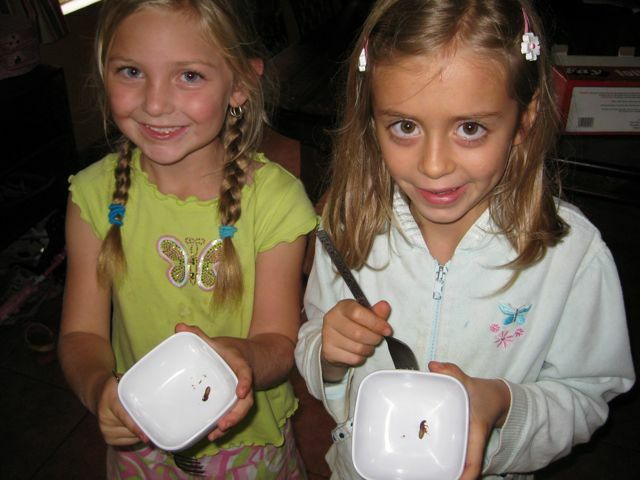 The surprisingly positive reaction to the taste of fried flying ants. Well, the pictures about say it all. I don't know if I should be more surprised that Amelia wanted to try eating a flying ant, that she said it tasted, "good, like bacon," or that Malin knew enough about cooking to fry it in butter. This 8 year old boy was scared to see me after falling on his face on the way home from school. Believe me, I'm often just as scared of these little patients as they are of me. Intra-oral x-ray shows intrusion of both central incisors (note discrepancy in position of central incisor edge to lateral incisor edge). Apices seem 90 to 100% formed so repositioning, splinting with composite and SS wire, Ca-OH pulpotomies, and eventually RCT was our planned treatment (96% of teeth with intrusion injuries will become necrotic). Note tooth #9 seemingly with its apex pushed into the nasal space. No root fracture is seen. You can see the aftermath of the accident. There should be as you know be two teeth nicely with their natural crowns exposed. You can see both teeth intruded well into the gingival tissue. Diagnosis of intrusion greater than 6 mm indicates surgical repositioning. 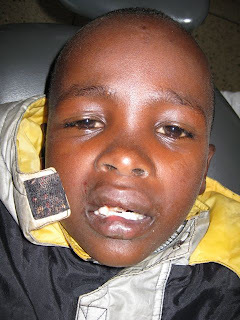 After a lot of tears, some screaming, and a very unhappy little boy the teeth were repositioned and splinted. Next up the pulpotomies in a few weeks. I hope we become friends by then. No we are not in Paris. We are still in Kenya. 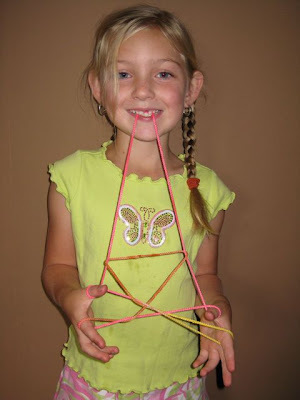 I've never visited the Eiffel Tower on the Champs de Mars but according to Amelia this is what the 19th century iron lattice tower looks like if it were made of string. How to create "Killer Community" anywhere! Maybe some of you have been involved in some "killer community" small groups within your church, college, or circle of friends? When a small group has good chemistry the results can be remarkable. Weekly time together is anticipated, strong friendships develop, healthy community prayer practices emerge, corporate faith grows, and ultimately in a gathering as such I believe God is glorified. Maybe you also have been involved in a small group community that was far from “killer” and just needed to be killed. If you are lucky these groups quietly and hopefully rapidly disperse and disintegrate. If you are not so fortunate these groups painfully endure week after week. Meetings are avoided, conversation is awkward and forced, and the whole thing seems like work instead of spiritual refreshment. It is clear that God calls us to gather together in community (Zep 2:1). Something special (including prayer, companionship, vulnerability, accountability, God’s word is opened, to name a few) occurs when people make time for God by making time for each other. 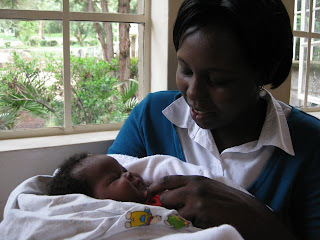 Within Kijabe Hospital, Moffat Bible College, and Rift Valley Academy (all three within walking distance) there are probably upwards of 150 Missionary Units (families, couples, or singles). A missionary community this size brings with it the blessings of diverse resources, a dynamic atmosphere, a school for our children, and a strong corporate community. The downside of a community this size is the real possibility of feeling lost. Maybe you have been in community without having community in your church, workplace, or school? Community rarely just occurs spontaneously. It seems to take a mix of commitment, time, intentionality, and simply making meeting with others a priority. We have been blessed by a gathering of five families that started at the beginning of the year. We find childcare while the adults gather for prayer and study. Shortly after that, the kids return and we conclude with music and dinner together. Is it working? I think so. The attendance is consistent, the meetings are anticipated, and most importantly I think we acknowledge our reliance on God and each other. I don’t know what makes one small group “killer” (which is uplifting) and another small group “needing to be killed” (that’s OK also..many things God has a season for). But I know God would believe it is worth trying. The following short humorous video clip is well worth seeing! It is Jonny and Chachi’s invaluable “advice” on how to experience community at its finest. Let me know what you think. Have you read the awards for best city in America to live in and they come out with towns like Kalispell, Montana, Ft. Collins, Colorado, or Amelia Island, Florida. I've never seen the opposite list of most down-and=out towns in America (Detroit, Michigan, Youngstown, Ohio, etc). But recently the Economist came out with an award for the world's worst country in the year ahead (2010). They say, "calling this country is a stretch. It has a president, prime minister, and a parliament but with little power outside their capital city. Even their presidential palace requires an outside peacekeeping force to protect the president. In this country more than 40% of the population need food aid to survive and one in every 5 children is malnourished. 1.5 million people live in dire, temporary camps. The future of this country is bleak. The country has a meager economy, and the aid that has been promised often can not get to the people who need it because security can not be guaranteed." 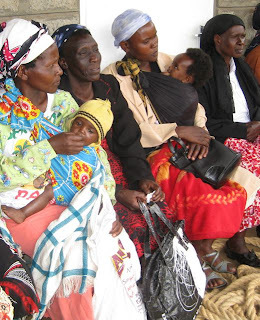 Residents of this country come to Kijabe Hospital frequently for care. I am told this people group is amazed at how quiet the hospital is without the noise of any gunshots or explosions that they are accustomed to hearing back home. Their greeting I have learned is Nabut Mia. This translates to 'is their peace'...that being the first thing they ask anyone they meet. The only history they know is instability, fighting, violence, and civil war for the past 20 years. I don't write this to knock them down...but to recognize what an opportunity we have at Kijabe to have them come to our hospital. 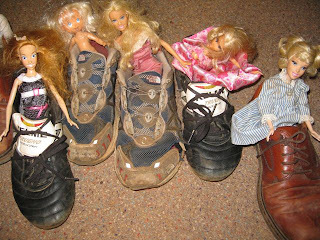 Inside they are likely broken, fearful, and uncertain about their future. If you have not guessed which country this is...the dubious honor of world's worst country goes to our neighbors occupying the Horn of Africa...Somalia. 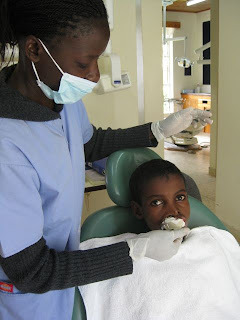 It wiggled for days and days and even though Daddy is a dentist..this 6 year old patient would not let him extract her front tooth. It finally came out at school and was brought home in an envelope. I think Amelia looks like a Hockey Player. If you ever listened to Marv Albert the announcer for the New York Knicks NBA team you would have heard his emphatic, extended trademark phrase of "Yessssssssss!" Meredith has picked up that phrase in her everday life. "Daddy can I have Rice Krispies? Yesssssssss!" "Mommy, can I sit in the front seat of the car? Yessssss!" "Sister, can I use the pink crayon? Yessssssss!" We (myself and my father) operated on Florence in December to remove a low grade mucoepidermoid carcinoma (minor salivary gland tumor) of the hard palate. The tumor covered 75% of the hard palate and to remove it we stripped the mucosa off leaving raw palatal bone. After seeing her 1 months later I was concerned that the tumor had reoccurred. There was bleeding, raw palatal bone exposed, and very slow healing. 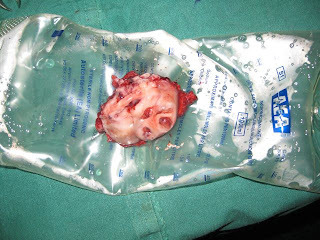 You can see the original excisional biopsy specimen above. When I heard Florence was here at Kijabe Dental again for her reevaluation I was dreading seeing what her mouth would look like. I was expecting bleeding, poor healing, and the necessity of a rebiopsy to check for reoccurrence or her cancer. But to my surprise the palate was now covered with healthy, pink, firm, stippled gingiva, and no signs of cancer. Florence as you can see was pleased as was I.
I like lists. I’ve written a list of 50 things I want to do before I turn 50. I’m currently reading a book about lists (Checklist Manifesto by Atul Gwande) and how lists insure things are done right (maintaining safety in take-off of a Boeing 757, building a 80 floor skyscraper so it won’t fall over during high winds, placing central lines with low infection rates). I put lists around our dental clinic to remind our staff where things go, when things are to happen, and who is coming. But I hesitate to write a list about missing...because it quickly transforms from what I miss (family, church, etc) to a pity story and/or complaint machine (bad African roads, inferior medical instruments breaking down, developing nation infrastructure, etc). Woe is me! I also wanted to wait until we lived in Kenya a substantial length of time (now 17 months) to figure out what I really missed (family) and things I could live without (Cinnamon Toast Crunch). I hope this list will share what we miss (because they are important parts of our life) and not come across as critical to Kenya, its people, or culture (We are blessed to be here with these good people). So here are the 10 things we miss about home in no particular order. 10- We miss the freedom to travel at night. Roads are not marked and cars often have one working headlight...that single headlight approaching may not be a motorcycle but a Lori (I also saw a motorcycle driving by flashlight), and bandits are about... it’s just not safe to drive at night. Where would we go if we could? Maybe a movie, a coffee shop, a book store, or out to dinner..with the girls falling asleep in the back in the dark on the way home and Sara and I talking. 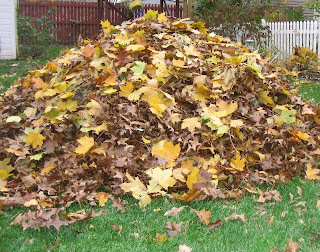 9- We miss the seasons. The weather is 50-75 degrees daily, usually sunny, probably a lot like San Diego. The sun rises EVERYDAY (along with Meredith) at 6:15 AM and sets EVERYDAY at 7:15 PM (we are within driving distance of the equator). I could not tell you when the best month to harvest corn or plant tomatoes is and they may be the same month for all I know! The weather is so regular around Kijabe it can get a bit monotononous! What seasons do I miss? We miss the authentic Autumn of Ohio with school resuming, the excitement of College Football, pumpkins on the porches, piles of leaves blowing down our sidewalk, the reds, yellows and orange of the Cuyahooga Valley National Park blurring together. We miss the winter of Central Oregon with white snow, x-country skiing to Tumalo Falls, Christmas Lights, a warm fire at home, nice turns on the Outback lift at Bachelor, and a Fir Christmas trees that smells everything like Christmas should. We miss the Spring in Portland and Seattle as the Crocus peak through even in late February, the blooming house size Rhododendrums, the scent of NW coffee (even though I don’t drink coffee), hiking in the Old Growth Forests, and wearing a Gortex coat in lieu of a umbrella like any proud Northwestener would do. We miss the summer of the Puget Sound as the Ferries are passing by, the lakes are prime for water skiing and swimming, the ocean is alive, the daylight that extends just when you need it most to get in that last bike ride, jump shot, or walk to get ice-cream with the girls. 8- We miss our country. I didn’t expect this at all until we were at a conference about reverse culture shock and it was suggested that when repatriating strong emotions, tears, and love for your home country can emerge; and I realized I hadn’t seen our flag or sang our national anthem in over 16 months (this also coincided with the Winter Olympics). I became sad and proud of the USA at the same time. 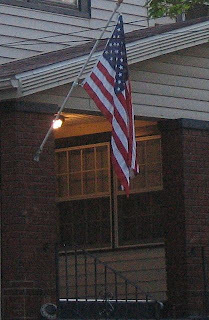 I wanted to pledge allegiance, sing the star-spangled banner, and read the Declaration of Independence all at once. Without being ethnocentric, jingoistic, or any other ‘ic’ I have become even more aware that the United States is strong, generous, honest, free, and amazing country to call home. I’m more proud to be and American citizen living in Africa than I ever have been before. I’ll leave it at that. 7- We miss the American health care system. I know the system in America has faults. I know health insurance is expensive. I realize too many people that want to be insured are not. But once you have a condition that requires surgery in a third world setting...you will yearn for any City Hospital in America compared to the best hospitals here (no criticism intended) in Africa. We have missed the nursing care, specialization, privacy, competency, compassion, cleanliness, and excellence that the American Health care system provides. 6- We miss not being with family and friends when they need us. We are sorry! We feel helpless here when back home someone we know has open heart surgery, misses out on job sorely desired, is working things out in a new relationship, faces an unknown future of transition, has health problems, is in the hospital for pre-term labor, is redefining family, is fired from a job, has a big test, is being scrutinized, has lost their house, lost a family member, has problems with their children, isn’t being heard, wonders where God is right now. All of this and more has happened to family and friends since we have been gone. Skyping, e-mail, blogging, and mobile phones are great inventions but vastly poor substitutes for a hug, prayer, shared tear, a word of encouragement, or a cup of coffee together. We are still praying for you. Thankfully, there are no physical boundaries that prevent God’s ability to answer prayers. 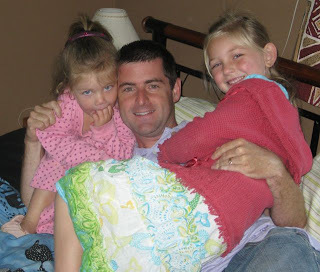 5- We miss being with family and friends during the great times. The other day Meredith said, “Daddy I miss my cousins.” I wondered which cousins she was talking about as she now has 7 cousins (two new since we have left) and two other we have met just twice. The little ones (cousins and friends) are growing and we have missed countless birthdays, 2 Christmases, wedding, new births, Summer Reunions, graduations, and much more. 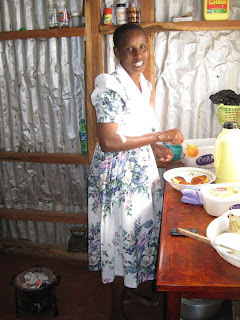 I have heard of missionaries that have prayed that “God would take their longing for their families and friends away, to help them better serve without distraction.” Hey, we have been blessed with great friends at Kijabe and Tenwek...but our thinking is not in that camp! Our friends and family back home (YOU) are irreplaceable. And though we know the party must go on without us...we think it would be a much better party with the Friess Family present! 4- We miss being connected. They say a missionary is at best at least a season behind and at worst forever stuck in the year they went out on the mission field. That either means we are still living in 2008 (I think ‘W’ is no longer President) or at best somewhere in the spring of 2009. Occasionally I see Western visitors coming wearing rolled-up pants, big sunglasses, loafers, v-neck sweaters, collars up, and bigger hair than I am used to (is this the 80’s again)....and I wonder why are they dressed so differently? But it happened so consistently I finally realized no Malin...you are the one that is out of style (which is no big suprise). If I could just find my pegged pants, hairspray, and Izod shirts from 8th grade! We missed celebrating together as Americans the Winter Olympics Gold Medals and Inauguration of our new President. Just the same coming together for the Relief in Haiti and even the downturn in the economy and just trying to understand the implications of the health care reform. 3- Can we each have a few superficial things we miss? Chipotle Burrito (black beans, cilantro, white rice, beef), a smooth road (for driving or cycling), street lights, pop tarts, Philadelphia Cream Cheese, Cosco, March Madness, Borders Books, Nightly News, NBA Playoffs, and reliable internet. 2- And for Sara (a bit more refined)? Starbucks Coffee with friends, the convenience of Target, Panera Bread, a flat trail in which to run, NW Seafood, a great salad, and the Fine Arts (Broadway Musicals). 1- We miss our home churches? We miss worshiping with you through good music, engaging bible study, challenging sermons (Our home pastors are great and most any sermon they give could satisfy the 3AM phone call rule..Pastor what is your sermon about?...and they could give you the answer in one concise sentence! ), and most of all your friendship. You are indeed glorifying God in how you worship. And also glorifying Him in your support of our family in Kenya. Being called to be in Kenya now feels right, different, and far away from home all at once. There are many bad reasons to be a missionary; the desire to hide-away from Western Culture, because my parents were missionaries, I don’t know what else to do, I don’t get along with my family, I don’t fit in back in my home country, I want to be known as a missionary, I want to own a big safari truck and drive fast on dirt roads, I want to be a minority, or because it is legal here to have more than one wife. There are many good reasons to be a missionary; the desire to travel to new countries, to experience other cultures, to identify with people different from one’s self, to give back to the poor, to build churches and houses, to bring clean water to the thirsty, to provide healthcare to the poor, to teach a language are just a few good reasons that come to mind. I know myself am guilty of motivations that are not particularly wrong (I want to live a meaningful purposeful life)....but also are not as pure as I would want them to be (I help because I care). Can I turn my motivations away from fulfilling my own needs to accomplish (not a terrible thing) to loving the people I am serving (a much better thing) on my own? Only the love and forgiveness of our Redeemer Jesus Christ can transform my sinful heart (which even when helping those in need is misdirected by selfish ambitions) to something new and pure (simply loving those I am with). Amelia's favorite game. We play over and over and over. And while the game teaches to say, "Sorry," it does so while you are intentionally making the other person lose. There's something sort of wrong about tritely saying, "Sorry," and making the person start over time and time again. But wait the opponent also gets to smile and say, "Sorry," as your player goes back to start. Has anyone else ever been bothered by the lesson taught in this game? It seems to teach: say "sorry" and you can do anything you want to the other player! Alright maybe I'm taking the game to seriously or just trying to find an excuse not to have to play again! Whenever I've taken a spiritual gifts assessment, the gift of encouragement is always on the list, but never by my name. I admit I find it hard to "encourage." It's much easier for me to be analyze, try to improve, critique and yes sometimes be critical. But I see in Meredith the very thing I find hard to do. 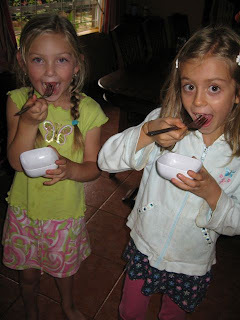 At dinner, "You make the best soup ever mommy." At bedtime, "You're the best mommy ever and you're mine." At breakfast, "I love to wake-up and see you mommy." During the day, "You're my favorite mommy, when I grow-up I'm going to be a mommy like you." "Mommy you look pretty." "Mommy, I like how you painted your toenails purple." And it continues talking on the phone with Nana and Papa, "Nana, you're the best Nana ever. I really miss you." To her sister after falling, "Sweetie you'll be okay. Let me help you." Okay, you get the point. She gives more encouragement in 24 hours than I usually give out in a month. Hebrews 3:13, "Encourage one another daily, as long as it is called today, so that none of you may be hardened by sin's deceitfulness." I pray Meredith will always be quick to encourage and that I will be quick to encourage others as well. 10 days after birth. For those of you that don't know much about sodiums this level means severe dehydration and high risk of neurological impairment not to mention the possibility of imminent death. But God was gracious and it was a joy to see them both! 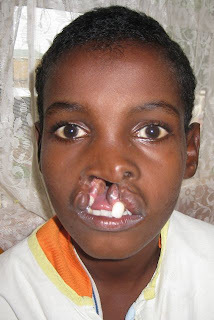 Our patient I will call 'M' has lived with the defect of unilateral cleft lip and palate since he was born 10 years ago. It is disfiguring, causes difficulty chewing, makes pronunciation of words nearly impossible, and forces M to live with a chronic sinusitis and runny nose as the nasal turbinates are directly exposed to the mouth. Despite this M is seen on the playground adjacent to the pediatric ward with a gigantic grin as he comes down the slide. M was referred to dental after an unsuccessful surgical attempt was made to close the lip and palate (the wound dehisced and separated). 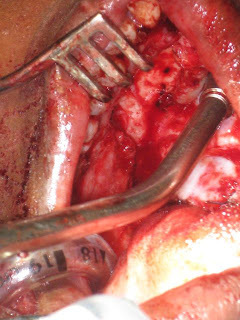 A second surgical opinion thought the distance (probably 10-15 mm) was just to severe to achieve a successful union of the lips and covering of the palate. Winnie taking an impression on M for a perhaps a newly invented appliance we are calling a rapid palatal condenser (RPC). 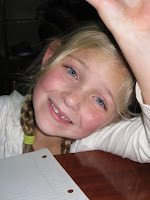 You may know about the traditional appliance the Rapid Palatal Expander (RPE) or better known as Hyrax if you had orthodontics as a child and suffered from a posterior cross bite. The RPE consists of a screw attached to the posterior teeth. 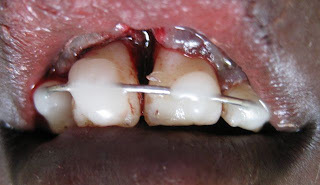 The device is designed to break the palatal suture of the developing child in a short time period. 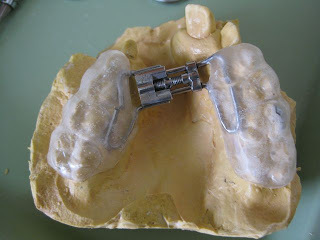 With each twist of the screw over a two week period the device separates .25 mm and the teeth begin to move laterally into their correct position. 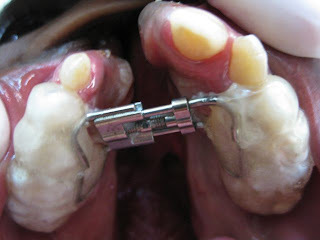 Some feel the RPE is more of torture device because it causes pain (even a sound as the boney palatal midline suture breaks), headache, and gap in between the upper central incisors with each twist of the screw by their parents. We reasoned that if you can use a RPE to expand the palate, why not use a RPC to bring a cleft palate and lip together. You can see the appliance above cemented in place. We are giving it a few turns of the screw each day to see if we can achieve sufficient closure that M can go for surgical repair. Rose works as a unit clerk for ENT and became a good friend in the past 4 months. 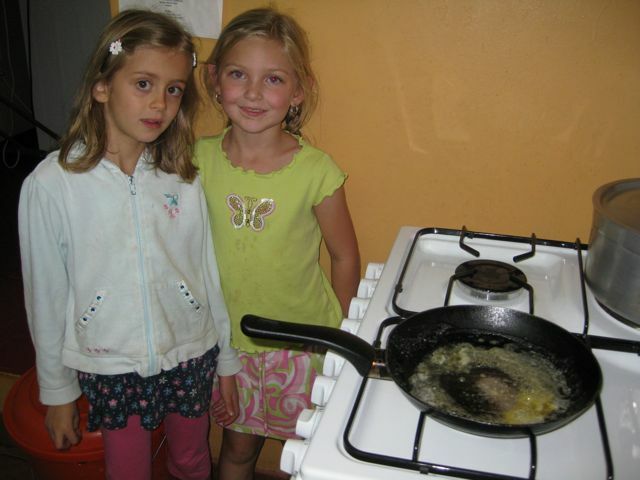 In October a gas burner caught fire in her home. 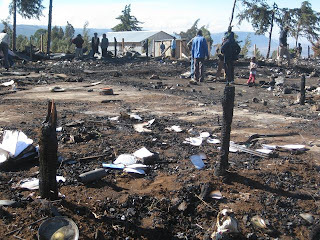 In less than 5 minutes this was all that was left of her timber house and the homes of eight others. Rose and her husband got out safely but lost everything they had. 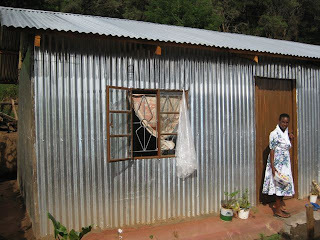 The hospital set up a fund to rebuild Rose a temporary house which you can see above that she moved into last week. I told Rose that we had many generous people back in America who were supporting God's work in Kenya. These people wanted to help someone who is in need and trying to rebuild, I asked her if there was anything she needed. 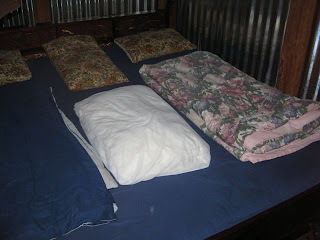 Rose told me that they needed a simple bed and mattress. 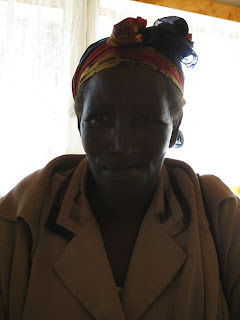 Because of your generosity funds were used such that Rose and her husband have a place to sleep at night. Asante Sana! 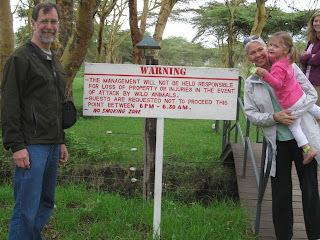 Just a couple pictures from our visit to Lake Naivasha yesterday. We saw lots of birds, water buck, giraffe, hippo and zebra. Only a 40 minute drive from Kijabe. It was good to see all the rain had raised the level of the lake; although more is still needed. Meredith has enjoyed all the attention. Amelia wanted to skip school yesterday "so I can be with Nana and Papa," tempting offer, but in the end decided it was best for her to go! So she called at lunch to say she had a "bad headache" and needed to come home. I told her we were at Naivasha and that she should go to student health. Her headache improved as she remembered it was computer class in the afternoon. We were glad to see Nana and Papa at the airport Sunday morning. 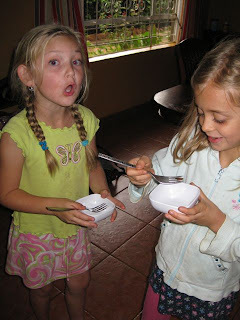 After sorting out the luggage that didn't arrive, we went to Java House for breakfast and then headed back to Kijabe. They managed to mostly stay awake until dark (7pm)! It's good to have them here.